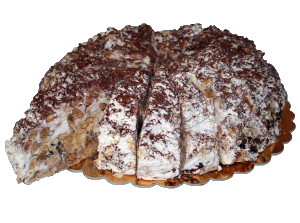 Sara Dolciaria produces the original Italian nougat cake following the traditional recipe and using exclusively Italian products, a true “MADE IN ITALY” specialty. 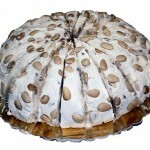 The cake of soft nougat Sara Dolciaria is made with fresh ingredients, such as almonds, sugar, honey and egg white, all used products are made in italy and the production is completely handcrafted. 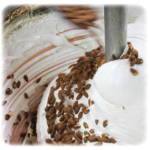 All our confectionery products are made following the ancient handicraft method that implies the exclusive use of excellent raw materials and a long cooking time with steam in torroniere of copper, in order to get and to exalt the authentic flavor. 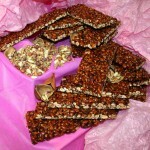 Sara Dolciaria is a family business that produces nougat, brittle and chocolate for over 25 years, using artisanal methods of processing, without any machinery that uses scanning rhythms and hectic times. Our flagship product regarding our italian soft nougat cakes is the line “CM28”. In fact, this line gives a true moment of sweetness, an engaging experience and a wider and wider available range. 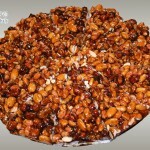 The italian soft nougat cake is made with almonds, sugar, honey and egg white and can be customized according to your requirements, giving you the opportunity to choose among more than 100 flavors developed over the years. Among our many tastes, the most requested are: the classic soft nougat cake with almonds, the nougat cake with sour cherries, or with candied fruits, pistachio, lemon and orange, or like the one in the picture,soft nougat cake and tiramisu. 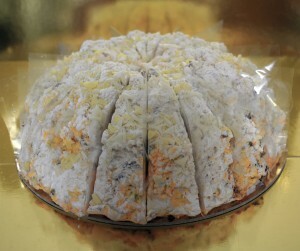 >> Go to our website page of nougat cakes “CM28″ to discover all available flavors! All our nougat cakes can be customized with your logo or with the corporate brand. 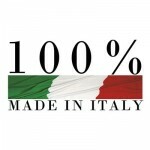 So you can have a handmade product of high quality and fully MADE IN ITALY personalized just for you! Also all our cakes are, on request, cut into slices and individually wrapped; our nougat cake “CM28” is about 4 kg and is portioned up to 20 slices of about 200g each. Our cakes have a shelf life of 18 months and should be stored in a cool dry place, not refrigerated. All of our products are exported around the world, from Australia to America and are shipped by international couriers. If you are a wholesaler or retailer please contact us to know our offer; the company is also willing to send samples of the products, catalogs, promotional materials and more.